Valentine's Day with MSV - make hearts race! 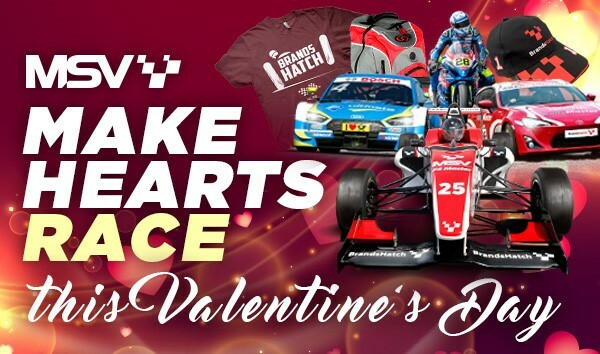 Set hearts racing this Valentine's Day with a motorsport-inspired gift from the MSV shop. There's a host of treats on offer to suit every pocket, from keyrings and retro t-shirts to race event tickets and driving experiences. Below are a few ideas that are sure to be a winner this Valentine's Day - check out the full gift selection here! Race event tickets are available for many of this year's major meetings at all of our circuits - Brands Hatch, Donington Park, Oulton Park, Cadwell Park and Snetterton. We're hosting eight rounds of the British Superbike Championship and five rounds of the British Touring Car Championship, plus international events such as DTM Touring Cars and Blancpain. There's something for everyone! Event tickets offer an affordable and action-packed day out, with plenty of support races and off-track attractions to keep motorsport fans entertained all day. And if you've got kids under the age of 13, they can come for free to any of our events! Click here to view a calendar and purchase tickets. We offer a wide range of men's and women's clothing including specially designed retro gear, t-shirts, sweatshirt, hoodies and jackets. All of these are high quality products and the perfect way to show the love for your favourite racing circuit! Click here to browse MSV's clothing range. Why not treat the motorsport lover in your life to a monetary gift voucher so they can take their pick of our fabulous gifts? Vouchers start at £10 and are valid for 12 months. They can be redeemed against ticket purchases, merchandise, season passes, and all driving experiences. Click here to purchase a voucher. If you're looking to go the extra mile with a gift this Valentine's Day, how about one of our adrenaline-fuelled driving experiences? We've got everything from the single-seater thrill of F4 Master to the power-sliding fun of RallyMaster - click here to find out more!